Random Forest for Loan Performance Prediction — Kimberly Coffey, Ph.D.
Random Forests are among the most powerful predictive analytic tools. They leverage the considerable strengths of decision trees, including handling non-linear relationships, being robust to noisy data and outliers, and determining predictor importance for you. Unlike single decision trees, however, they don’t need to be pruned, are less prone to overfitting, and produce aggregated results that tend to be more accurate. This post presents code to prepare data for a random forest, run the analysis, and examine the output. The specific question I answer with these analyses is: what is the predicted percentage of loan principal that will have been re-paid by the time the loan reaches maturity? I’m using publicly-available, 2007-2011 data from the Lending Club for these analyses. You can obtain the data here. For purposes of these analyses, I'm treating the outcome we're modeling - loan performance - as a continuous variable and conducting a regression-based random forest, rather than a classification-based one. Another approach to this kind of task is to divide loans into categories (e.g., "good" and "bad") and classify them accordingly. is.na(loan) <- loan == ""
# This produces some missing data for values of emp_length that were "n/a"
Most loans have been paid back in their entirety (these are the values stacked up at 1). This makes sense because these are loans that presumably went through some sort of initial vetting process and passed before the Lending Club issued them. (Additionally, the Lending Club makes this loan data publicly-available, so they probably feel good about having potential investors see it.) Among the loans that weren’t paid back in full, a significant portion of the loan has still been repaid: the smallest percentage of repaid principal is 83%. One of the strengths of decision trees and random forests is that you don’t have to spend a lot of time up front carefully selecting your predictors – the analysis will let you know which ones are most important. For this reason, I like to ask R to model all possible predictors (using the “randomForest(dependentVariable ~ . , …)” syntax. Our particular dataset includes some predictors that refer to things that would have happened after the loan originated, though, like the current loan status. We have to remove these, or we’re not accurately simulating the challenge of predicting, before the loan has been issued, how much of it will be paid back. Random forests calculate error on out-of-bag observations, so technically you don’t need separate training and testing datasets. I create them here just because it simplifies the example a bit to have distinct training and testing datasets. This provides us with a sorted list of predictor importance. Larger “IncMSE” values indicate that the variable is more important. Strangely, we see that issue_d (the loan's issue date) is a very important predictor, even though we filtered the data to only include loans that had already come to term. The next pieces of code investigate this further. This graph illustrates that most of the Lending Club’s loans from 2007-2011 were repaid in full (most data points are at 100%). 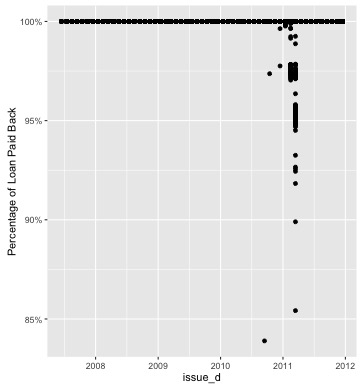 Loans issued between September 2010 and March 2011, however, are less likely to have been repaid in full. The data don’t tell us why this happened – the Lending Club may have changed their lending criteria during this period or something like that. This figure lets us know that the variable importance results do make sense, given the data, even though issue date may be a much less important predictor during other time periods, or possibly for other banks during the same time period. This figure demonstrates one of the advantages random forests have over single decision trees - you can see that error drops as the number of trees grows. As I mentioned above, randomForest will give us the out-of-bag error rate on the training data, which is a measure of prediction error for observations when they weren’t included in a given bootstrapped sample of the data. The mean of squared residuals in the specific training set I’m working with is ~0.000008, so we’d expect something similar when we apply the model to the test data. Given that we treated loan performance as a continuous outcome, it makes sense to use a continuous measure of prediction accuracy, like mean squared error. Another way to look at the success of our loan performance predictions, however, is the binary measure of how often our predicted paid.back value for a loan was exactly right. The value I get for the percent of correct predictions, in my test data set, is ~98%.